Vadim Zakharov, Tunguska Event, History Marches on a Table, 2017. Copyright and courtesy the artist. Renowned Russian artist Vadim Zakharov (b. 1959, Tajikistan) presents two evenings of exhilarating and subversive performance. A ballerina, a dog, a couple in love, an accordionist and garbage collectors feature among the characters. Taking inspiration from a wide range of cultural sources, from the book Incomplete & Utter History of Classical Music by Stephen Fry, Igor Stravinsky’s ballet Petrushka (1911) to Marcel Duchamp’s Bottle Rack (1914), Zakharov conceives a humorous journey across time and history. A cast of men and women appear throughout the performance and stage key events that marked the period. On a large, rectangular structure which spans the length of Gallery 2, viewers are invited to take a seat at a table which acts as the stage. The event coincides with the centenary of the Russian Revolution and highlights key moments in Russian culture of the time through theatre, performance and cabaret. Tunguska Event, History Marches on a Table is Whitechapel Gallery’s third collaboration with the V-A-C Foundation committed to the international presentation, production and development of Russian contemporary art and cultural practice. Vadim Zakharov was born in Russia in 1959. He is an artist, editor, archivist of the Moscow Conceptual art scene and collector. Since 1979 he has participated in exhibitions of unofficial art and collaborated with such artists as: V. Skersis, S. Anufriev, A. Monastyrski, Y.Leiderman. From 1982–1983 he participated in the AptArt Gallery, Moscow. Since 1992 he has published Pastor magazine and founded the Pastor Zond Edition. In 2006 he edited book Moscow Conceptualism. In 2008 he founded the website conceptualism-moscow.org. His retrospective 25 Years on One Page was held at the Tretyakov Gallery in 2006. He represented Russia at the Venice Biennale in 2013 with the project Danaë. He lives and works in Berlin and Moscow. 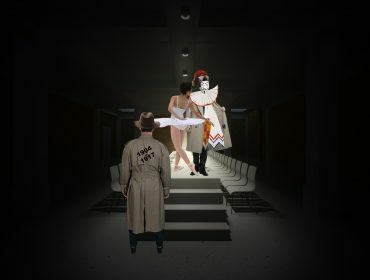 Following the success of Kabaret Kultura in 2016, Tunguska Event, History Marches on a Table is Whitechapel Gallery’s third collaboration with V-A-C, a non-profit foundation established in Moscow in 2009, for the international presentation, production and development of Russian contemporary art and culture. A series of four displays from the V-A-C Collection were shown in a dedicated Collections Gallery from September 2014 – August 2015 as part of the Whitechapel Gallery’s ongoing programme of opening up rarely seen public and private collections from around the world. V-A-C Foundation is a not-for-profit private institution founded in Moscow in 2009 by Leonid Mikhelson (Founder and President) and Teresa Iarocci Mavica (Director). V-A-C is committed to the international presentation, production and development of Russian contemporary art and cultural practise – across a multitude of forms and within the framework of an invigorated and informed exhibition, educational and publishing programme. Particularly important to the new generations of artists in Russia, V-A-C’s focus is on practically supporting and expanding the platform for home-grown talent, challenging artists to experience, engage with and interrogate international cultural practices whilst developing an authentic and autonomous artistic language. It is deservedly considered as one of the key proponents in opening out contemporary Russian culture to the wider world, through finding new platforms for exhibition, performance, live events and cross-cultural exchange. The Foundation opened its first permanent exhibition and residency space at Palazzo delle Zattere in Venice in May 2017, and work is underway to develop a major art site in Moscow, designed by Renzo Piano Building Workshop, due to launch in 2019. V-A-C Collection is a constantly developing body of works including sculptures, paintings and photographs from leading, internationally-recognised artists such as Francis Bacon, Alighiero e Boetti, Liz Deschenes, Natalia Goncharova, Wade Guyton, Wassily Kandinsky, Lucy McKenzie, Amadeo Modigliani, Sigmar Polke to Mike Nelson, James Richards, Gerhard Richter, Bridget Riley, Egon Schiele, Dayanita Singh and Christopher Wool. Join artists Vadim Zakharov and Nikita Alexeev and art historian Margarita Tupitsyn as they revisit APTART, a series of self organised ‘anti-shows’, as an artistic and political project.